Why should universal income be universal? The idea behind universal income is to take care of people who can't afford the most basic of needs. That sounds great. But why then should the income be universal when the situation where somebody cannot afford basic needs is not a universal situation? For example, in the USA, anybody making over 50.000 dollars should certainly not be struggling to make ends meet. We are probably talking at least half of the labor force. Why should they also receive a basic income? Another argument is that incentives are not distorted. People who don't receive the basic income will obviously not have any change in their incentives*, and people who do receive the basic income are poor to begin with, so obviously their incentives are less relevant, since they aren't major contributors to the economy anyways. *not quite true that people who don't receive the basic income won't have distorted incentives. If you are only just ineligible for the basic income so that you would be better off working less and thus getting the basic income, that would be a problem ... but it's easily solvable: just make the payment of basic income linear so that those "discontinuities" are dealt with. The problem of giving X to people earning much more than X is very easily solved by taking it away again through tax brackets. At the moment, all forms of assistance come with intrusive questioning intended to measure whether they "deserve" it. This is tedious, difficult, and wearing on human dignity, especially things like disability benefits where you are expected to prove what you can't do. Given that we assume everyone deserves something, there is no longer any need for the questioning. Removing it enhances dignity and also reduces bureaucracy. Assessing need is complicated. Complicated things are expensive. A system that avoids assessment costs is therefore much, much cheaper. So from the point of view of administration costs, it's cheaper to just give (say) $1000 per month to everyone, rather than spending time and energy (and money) working out who needs it. The actual cost of the benefits (the $1000 dollars per month per person) is superficially, the more expensive part. However, we (that is, most countries) already have a system that both funds government expenditure and acts (to some extent) to redistribute money: taxes. Your imagined income threshold, above which you think people should not be receiving the money, simply becomes the income at which taxes are set to equal $1000 per month. The end result is that anyone with an income below that point, wherever it might be, receives their $1000 dollars per month from the government, but pays pay less than that that in taxes: a net income. Above it, people still receive the $1000 per month but, between that and their other income sources, wind up paying more than that in taxes. You mention distortion of incentives, particularly at the point where any additional income source would lead to no longer receiving government money and, therefore, result in a net loss -- a disincentive to work. You acknowledge this and attempt to provide a fix by tapering the benefit; however, the argument in favour of Universal Basic Income is that this tapering is, again, something we already cover in the tax system. Every extra dollar of income will incur less than a dollar in tax. Under UBI, extra income is therefore always (financially) worthwhile, with no further tweaking, as opposed to the situation in many welfare systems where passing some income threshold results in all benefits being stopped and, accordingly, a net loss of income. If a basic income is not universal, we're essentially back at the current situation for most European countries: anybody who doesn't have a job, or only a part-time job with a salary below a certain level, receives social assistance / welfare up to a level which is equal to or comparable to that of minimum wage. One could call that basic income but it really doesn't make a difference. From the point of view of those running the system, the primary advantages of a universal basic income over means tested welfare or guaranteed income systems are transparency and efficiency of distribution. Each person gets a pot, and money is paid into it without needing to collect any evidence beyond identity, and with fewer opportunities for gaming the system. Of course, this has to be balanced against the extra cost in funding people who don't meaningfully benefit, but it does move the conversation from one of morality to one of economics. In fact, this is exactly the other side of "flat tax" systems. What you are describing is not Universal Basic Income. It is simply welfare, just like it already exists in most of europe and north america (the execution may differ, but the idea of "giving something to people who truly need it" is the same). The whole point of UBI, is that it is Universal. That is the big factor that makes it different from welfare. Of course, you may argue that welfare is better. This is pretty much what your question is doing. But even if you think one system is better than another one, doesn't mean that the other one should not exist as an idea and be discussed. If, in another system, you give everyone the money they lack to reach $1000 a month, it essentially means that the first $1000 you earn every month means nothing, you would have gotten it by not working. This essentially makes a big split into the population. Everyone has a certain amount of effort and time they are willing to put in for a certain amount of money, but it differs from person to person. Most importantly, the more you are already investing and earning, the less willing you usually are to satep it up. For example, with a $100,000/year salary, many people would not be willing to work a 6th day per week to make $120,000 instead, even though all of those people are willing to put in the first 5 days at $20,000 per day. So with welfare, everyone that was willing to work for $0-1000 a month, will now not work at all, because they aren't willing to work enough to go past the $1000 line, and they won't get anything from all work before that line. With UBI, they can be willing to work for $500 only, and they will do it, because it increases their income from $1000 to $1500. You can argue all day that you think welfare is better, but the fact remains that UBI is an idea, with its own set of pros and cons, and most of the differences are derived from the "Universal" part, so as long as one person believes it is better, the idea will persist, and will stay universal. Remove the Universal, and you get a totally different idea, which is also preferred by many people, but those people aren't the same group. You can say "I think Welfare is better than UBI", but you can't say "I think UBI should not be Universal", because you are simply arguing for the removal of the idea itself. Standard Welfare systems create criminals. Many countries have Welfare systems where they try to help those who need help, and ONLY those who need help. Of course, some people will try to appear needful so that they get help they don't really qualify for. This is Welfare fraud. And of course, normal tax payers will resent these people. Since normal tax payers outnumber the needy, politicians will promise to crack down on Welfare fraud. One effect is that there is a huge bureaucracy dedicated to controlling Welfare recipients. This cost money. It also creates the true impression among the needy that the bureaucracy is out to get them. The "Welfare Police" catches a number of people. Some of these are deliberately defrauding the system. And they should be punished for this. My worry is the others, people who have made simple mistakes, misunderstood some instruction on one of the endless sequence of forms they have to fill out. In some cases, Welfare case workers have given bad advice. As a result, the recipient is accused and convicted of fraud. With Universal Basic Income, this all goes away. Everybody is qualified, nobody can sneak in. End of problem. The problem is that removing the basic income at an income threshold essentially makes it prohibitive to increase your income. E.g. in your example, anyone below $50,000 gets a supplement of $12,000. Above $50,000, zero. So if you make $49,000, there is no incentive to take a raise of $2000. Or even $10,000. Your overall income would become $51,000 or $59,000 where previously it had been $61,000. I.e. you make less money from getting a raise. So at $49,999.99, it's not worth getting a raise unless the raise is more than $12,000, to offset the lost payment. Going forward, I'm going to use a US-based example. Other countries will have similar programs that produce similar results but with their own individual quirks. So how would we fix that? One way is to make the payment fade out. At $0 of income, the payment is $12,000. At $50,000, the payment is $0. But that is an implicit income tax rate of 24%. Add that to a Social Security tax of 15.3% for a total rate of 36.5% (after adjusting the base) on the 0% rate up to $12,000. But after that, the income tax rate is 10% for a total rate of 45.8%. And then a 12% rate for a total of 47.7%. Which then drops to 25.4% before going back up to 34.6%. That's both weird and not progressive. So let's not do that either. Now consider a system with no Universal Basic Income (UBI) but with four tax brackets, 0%, 15%, 28%, and 38%. Now, it turns out that a system called Social Security exists and for those who pay the 15% rate, the total rate is about 28%. So we can think about there being two brackets: 28% and 38%. But what if we made one bracket? If everyone pays 38% but gets $12,000 back, for those with less than $120,000 in income, they're better off. They pay less than $12,000 in taxes and get a $12,000 UBI. Net they're ahead. At $40,000, the tax increases from about $10,788 to $15,200, but that is offset by a $12,000 payment. That's a net decrease of $7588. At $400,000, the tax has gone up by about $17,000. Offset by $12,000 that's still a $5000 increase. The zero point, where the basic income just matches the tax, is somewhere between $132,900 and $400,000. Probably around $300,000. TL;DR: A flat tax of 38% with a UBI is more progressive than either a threshold or a fade out if we include Social Security and Medicare taxes in the analysis. And that's why it is better for it to be universal than only given to lower incomes. In addition to the excellent answer by pjc50 about dignity, I would add that in every system there is a time delay between applying for a benefit and actually getting it. This can be over a month. So if you are on benefit and take a short term job for a couple of weeks then you have to deal with stopping your benefit for those weeks, then starting it again, and waiting for the point when your "new" benefit actually arrives. During that time you have no income, but you still need to eat and pay rent. This is a big disincentive to people on benefits taking short-term work. It is also a huge problem for people in the "gig economy" or on zero hours contracts. There is another advantage of UBI that has not been mentioned that is a halfway decent argument for the universality of the basic income, it is that generally without that universality the tax/giving authority needs to know about your family structure. So if your government is not explicitly a religious authority it is possible that your citizens can be married in the eyes of one religion but not in the eyes of your government; if so then the UBI would, if not universal, potentially amount to a program that says "Hey Alice and Bob, I will pay you both to not get married, because it turns out Bob has almost no income as the homemaker and Alice has all the income as the breadwinner, so Bob will cease to qualify for the basic income programs when we divide the amount 50/50." It's mostly just saying that you would like the structure to be explicitly family-structure-agnostic that leads to this sort of thing. Indeed, one can prove that the only forms of family-structure-agnostic progressive income taxes, each amount to a fixed-percentage non-progressive income tax plus a universal basic income offset. The economic argument for universal income is that it removes welfare overhead. If everybody gets universal income, there is no need to spend money to figure out who "deserves" welfare. Unlike "traditional" welfare systems, universal income motivates people to work by design. If we look at the "traditional" welfare systems from a naive and overly simplified perspective, people who earn less than $1000 simply get whatever difference they need to reach $1000 ( <- this is a naive and overly simplified example). People who get paid less than $1000 are better off not working at all in such a system. To counteract the current system's lack of intrinsic incentive to work described above, welfare does implement artificial incentives for people to get off of welfare, because it has to. These incentives, such as social shaming, forcing people to wait half a day in a queue, or requiring people on welfare to give up some of their basic rights, are not always contributing to the economy or to the society. 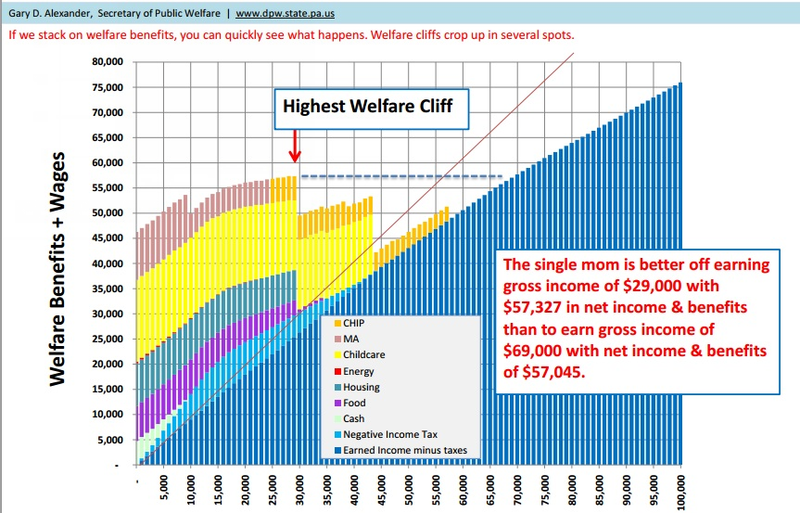 A "traditional" welfare system requires proof that somebody deserves welfare. This introduces a chance for a false result - both false positive and false negative, inherent discrimination against various disabilities (e.g. dislexia, discalculia, depression), and a delay during which people may be completely out of funds. Universal income is balanced with tax. People who earn sufficient money to live without universal income do pay more taxes than those who don't. The first has been elaborated in other answers. A welfare system that gives money only to those who need it is by its very nature discriminatory. It needs some way to figure out who needs, and it needs ways to avoid frauds, and it must be carefully constructed to avoid false incentives. All of which creates a nightmare of regulations, applications, forms and programs - or, in simpler words: A lot of opportunities for mistakes. The second wasn't mentioned so far: We can. The belief that financing UBI is the core issue couldn't be further from the truth. I'll take my home country of Germany because I know the numbers for it. It has around 80 million people. Giving every man, woman, child and baby 1000 Euros per month would cost 960 Billion Euros. While that's a considerable amount, it's only about a quarter of the GDP. It's less than three times the current government budget, but only 15% of the combined annual turnover of the German economy. It is a huge amount of money, but it is within the realm of the possible, maybe for the first time in history. Especially if you realize that this money isn't lost, and the vast majority of it will be immediately turned into consumption, especially since people no longer need to hoard money into pension funds for old age or keep reserves in case of unemployment. The fact that it is possible, that productivity has raised to such levels that we can think about UBI also opens the path to entirely new visions of society, in much the same way that new types of society appeared when it became possible for considerable parts of the population to not grow, gather, hunt or herd their own food anymore. And the only way to think about such societies of the future is to consider UBI to be universal. Other people have touched on this, but I think it should be made more explicit: there isn't really any difference between taking X, versus failing to pay X that you otherwise would have paid. Suppose someone has a job that pays $40k, and they also receive $12k in UBI, and they have to pay $6k to the IRS. We can call the $6k as "phase-out" of the UBI, or an "income tax" on the $40k, but either way this person is getting a take-home pay of $46k. What we call it is just a matter of semantics. Whether it is framed as a total gross income of $50k with a tax of $4k, or a base pay of $40k with a $6k UBI bonus doesn't affect this person's bottom line. So as long as there is still income tax, we have a situation that is, even if we call it be a different term, effectively a phase-out of UBI. Unless you're imagining that UBI will be accompanied by the abolition of income tax, your question doesn't really make sense. Universal income should be universal income for the simple fact that you can't just look at the income of a person and determine if they are living above or below the poverty line as there are many factors that would impact that besides how much money you get paid. You are making some bad assumptions. In your example you are assuming that someone making $50,000 a year has the same standard of living regardless of where they live. It should be noted that where a person lives and in what conditions (health, how large of a family, how many wage earners and other factors) are just as important as basic income when calculating how well someone lives. What people tend to forget is the poverty line is not the same around the country and or even in the same place from person to person. For example a single person with an income of $100,000 is going to have a much better standard of living then a family with 5 kids on the same income. As of February 2019, average rent for an apartment in San Francisco, CA is $3787 which is a 4.94% increase from last year when the average rent was $3600 , and a 0.4% increase from last month when the average rent was $3772. One bedroom apartments in San Francisco rent for $3402 a month on average (a 1.79% increase from last year) and two bedroom apartment rents average $4494 (a 1.58% increase from last year). According to that source the average one bedroom apartment costs $40,824 to rent in the city of San Francisco. Not the answer you're looking for? Browse other questions tagged basic-income or ask your own question. Instead of a Universal Basic Income program, why not implement a “Universal Basic Needs” program? Did any Basic Income Guarantee proposals/models incorporate “live where you can afford” angle? What kinds of policies are arising as automation dissolves more unskilled jobs? What are the cons for Universal Basic Income being a solution to automation? Why hasn't there been a stronger push for a job guarantee program, versus UBI? What do you call it when everyone gets an equal vote on how taxes are spent? Shouldn’t conservatives embrace universal basic income?